How the Flyer Does It! The bobbin sits on an axle between the flyer arms. The fiber you will be spinning is attached to the bobbin via a leader yarn that is threaded out through the orifice of the flyer. 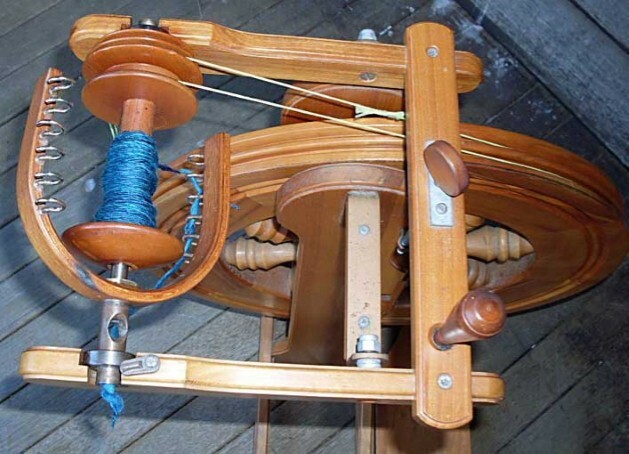 When the flyer spins (because you are treadling), it imparts twist to the fiber between you and the orifice. The pull on the fiber that you feel is called “take up”, and is a function of the difference in speeds of the bobbin and flyer. 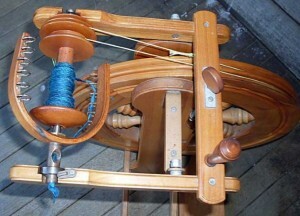 When you permit the fiber to move towards the orifice, it begins to wind on the bobbin.